Mathematics more often tends to delight when it exhibits an unanticipated result rather than conforming to … expectations. In addition, the pleasure derived from mathematics is related in many cases to the surprise felt upon the perception of totally unexpected relationships and unities. I have a theorem named after me. I did not name it, but I did prove it – well more like I tripped over it. 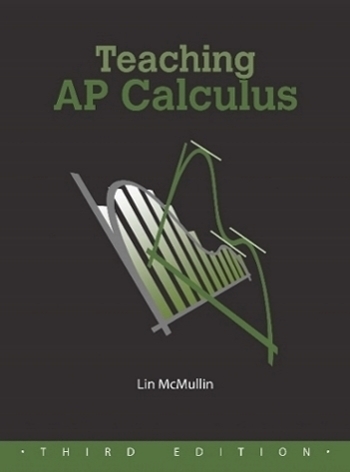 It is a calculus related idea. Here is how it came about. I say came about because as you will see I did not set out to prove this it. I just sort of fell in my lap as I was working on something else. 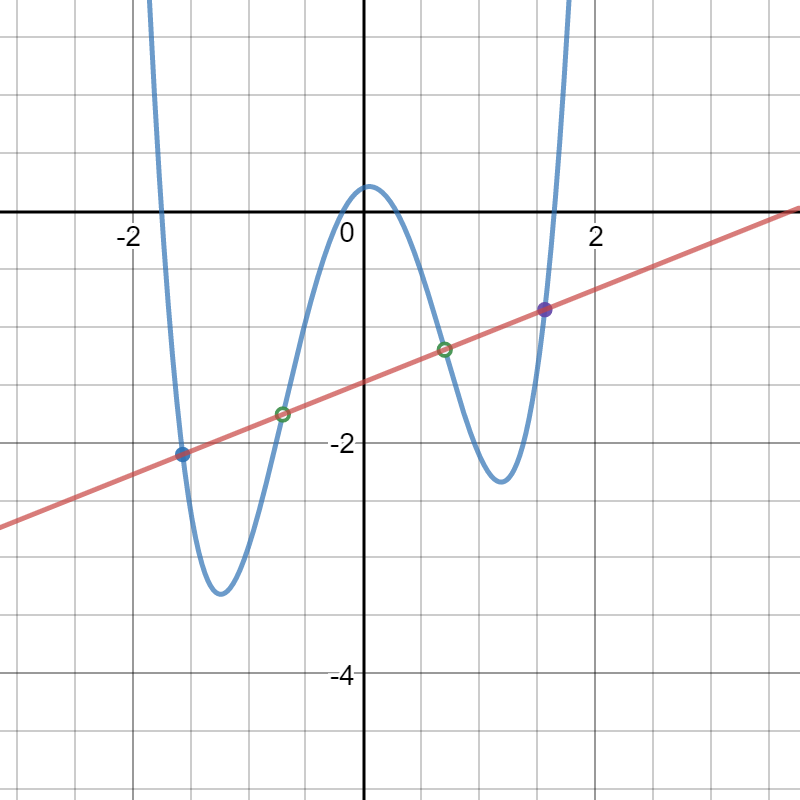 I was trying to do an animation of an idea that I had heard about: If you have a fourth degree, or quartic, polynomial with a “W” shape it has two points of inflection. If you draw a line through the points of inflection three regions enclosed by the line and the polynomial’s graph are formed. The areas of these regions are in the ratio of 1:2:1. In order to make the animation work I needed the general coordinates of the 4 points where the line intersects the quartic. differentiate it twice to find the second derivative. Then find the zeros of the second derivative (by the quadratic formula), write the equation of the line through them, and then find where else the line intersects the quartic. Without even starting I realized that even with a CAS the algebra and equation solving was going to be really fun (Not!). So I decided on an alternative approach. 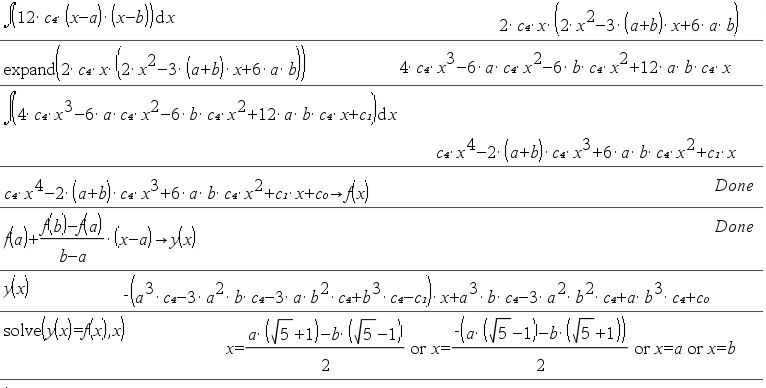 I decided to let the zeros of the second derivative be x = a and x = b, then at least they would be easy to work with. Then the second derivative is where the is the leading coefficient of the quartic and the 12 comes from differentiating twice. And that’s when I stopped astonished! Those numbers are the Golden Ratio , and its reciprocal . So the roots are and . How did they get there? To this day I have no idea why the Golden Ratio should be so involved with quartic polynomials, but there they are in every quartic! There were no assumptions made about a and b – they could be Complex numbers. In that case there are no points of inflection, but the “line” and the quartic still will have the same value at the 4 points. Here is a CAS printout of the entire computation. The Golden Ratio also appears in cubic equations. See the Tashappat – McMullin theorem here. Speaking of the Golden Ratio, the Calculus Humor website has a nice feature on the Golden Ratio in logos. To view it click here.